Aerospace engineering deals with designing and development of aircrafts and spacecrafts. It further has two fields of study – Aeronautical and Astronautical engineering. Being one of the top private aerospace colleges in India, Sandip University offers B. Tech in Aerospace Engineering that is in accordance with the industry trends in the country. Students who successfully complete their Aerospace engineering degree grow efficient in designing, testing and successfully manufacturing aircrafts and aerospace products. They can determine the technical and financial feasibility of projects related to the field. They are also capable of evaluating projects to test their compliance with engineering principles, customer requirements as well as environmental regulations. With a huge demand for engineers that are trained in aerospace engineering, we, at Sandip University, are committed to providing the best match. With a successful award of the bachelor’s degree in this field, our students will be capable of performing and executing the industry specific challenges. 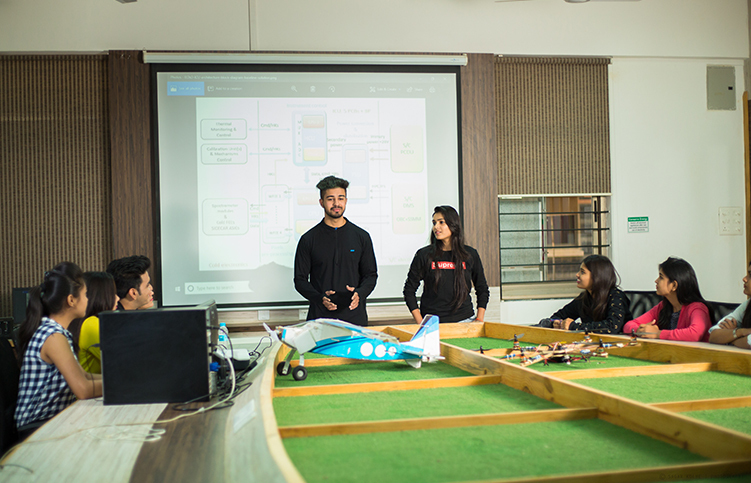 At Sandip University, Nashik, with a capacity of 120 students, we strike to offer the best facilities for imparting knowledge of aerospace engineering. With our many tie ups with the industry, we offer the most complete knowledge of the branch, which will equip our graduates with an unmatched edge over their contemporaries. With its constantly changing and evolving nature of the discipline, we, offer the most state-of-the-art facilities to produce one of the most skilled Aerospace engineers.